How Google no-Captcha Captcha slows down your mobile site. – Get under 2-second load times on shared magnetic hosting with free plugins and themes. Why does Google repeatedly mess up web speed? We don’t know. The harder they try the worse it gets. Here’s another unrecognized offense against mobile speed. What’s the cost of placing Google’s “NoCaptcha reCaptcha” on your precious website? Most site owners don’t realize the heavy speed impact of adding this Google-sponsored freebie. It’s speed-destroying bad news. NoCaptcha reCaptcha negates your hard work tweaking away milliseconds. So what is NoCaptcha reCaptcha – and how did it get such a goofy name? This is what it looks like today (see image below). We’re sure you’ve seen it before. It appears on many sites – big and small. All you need to use it is signing up for a Google API. NoCaptcha reCaptcha is an automated robot sniffer. It’s supposed to be intelligent. It monitors the user-approach path toward the button. Its original form was a sort-of-simple reCaptcha to catch spambots. API means “application programming interface.” It’s a set of protocols and tools for building application software. APIs are always several calls or requests to remote servers. This takes time and causes delays. The scripts used aren’t cached as part of your website. There’s no escaping the speed burden APIs cause. Does Google gather site data from its APIs and fonts? Of course. Why do you think it’s free? Above is the old-style reCaptcha. You had to read either numbers or letters from a photograph – or fuzzy squiggly words. Then enter those into a field. This annoyed people for obvious reasons. Can you read those dim numbers? Squint! Does it always work flawlessly? Nope. We attest to that from personal experience. If you fail the human test, it presents pictures to recognize. These include things such as “click on all the road signs” or “click on all the storefronts.” It can present never-ending pictures – even if you’re careful. Usability nightmare. Google introduced reCAPTCHA v3 in November 2018, which promises a new “frictionless user experience.” Earlier versions of the API stopped bots but also drew the ire of internet users across the globe. Users were regularly inconvenienced with distorted text challenges, street sign puzzles, click requirements, and other actions to prove their humanity. Annoying! The WordPress Plugin Directory has dozens of standalone plugins and contact forms that make use of reCAPTCHA in some way. Sites that are already set up to use v2 or the Invisible CAPTCHA, will not automatically update to use v3. There’s a different signup and implementation process that the site owner has to perform before having it integrated on the site. Before reCaptcha existed, “captcha” was used on comments, forms, and logins. Preventing and blocking spammers and hackers was the goal. A captcha was real simple. It had no API. 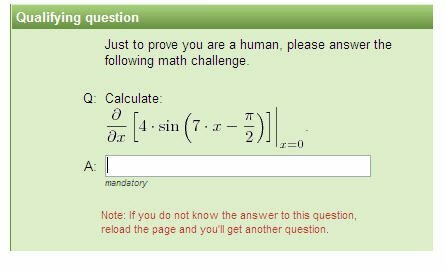 It usually asked you to answer a question, describe a picture, or solve a math challenge. A math challenge was something more like: “What is 1 + 1?” Or a text challenge might ask, “What color is the sky?” But some people answer azure or cyan – instead of blue. Does simple captcha still work? Yes. Do they add to page weight? No. Do they thwart SPAMbots? Yes. So why use a slow, heavier, sophisticated noCaptcha reCaptcha? Is Google spying on your site? We don’t know. It makes no sense whatsoever. So you’ll feel faddish and hip? Captcha and reCaptcha are used to protect comment forms, login forms, register forms, rest password forms, and block spam comments. There are over 50 captcha and recaptcha plugins in the free WordPress plugin directory. We downloaded them all to check them over. We aren’t making any recommendations. Why? Because captcha or reCaptcha – and especially noCaptcha reCaptcha – aren’t necessary in the least. Other plugins can take care of security and SPAM blocking without UX hassle for you or users. NoCaptcha reCaptcha adds 350 to 550 milliseconds globally to your website. When we say, globally we mean site drag. That is where a plugin or script slows down every single page and post of your website. Not only the page where a shortcode or appearance is located. Everywhere. How many HTTP requests or calls are added? Between 11 and 20. It depends on variables. It’s not always the same. Again, don’t ask us why. It’s a Google thing. The real kicker is sometimes server connections don’t happen smoothly. Then load times are unpredictable. Users complain of delays of up to 30 seconds. That’s correct. Not 30 milliseconds. Seconds! We just don’t think noCaptcha reCaptcha is worth it – especially for mobile devices. Gutenberg versus Elementor: mobile speed – good or bad? Previous PostPrevious Should I disable Font Awesome and Google Fonts for improved speed? Next PostNext Should I use GeneratePress or Astra theme with Elementor for mobile speed?